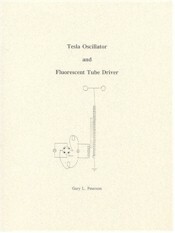 This booklet provides info on an important application of the Tesla oscillator, high frequency lighting. 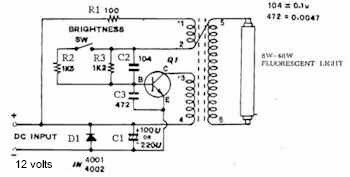 It gives full instructions for the construction of a one transistor battery powered oscillator that will run fluorescent tubes up to 40 watts. Printed-circuit artwork is included for those wishing to etch their own boards. Instructions are given for winding two different types resonance transformer. The oscillator can be used for a small scale demonstration of Tesla's Air/Ground system for wireless electrical power transmission. Before building and operating any of the circuits shown on the following pages, you should be aware of some potential hazards. The most immediate risk that you might encounter is that of radio frequency burns. Please be very careful when working close to the high voltage secondaries of these devices. The output voltage of the Tesla oscillator is fully capable of penetrating even through a persons fingernail, as this experimenter can attest to from personal experience. Special caution must be taken when bringing your hand close to any pointed metal object, such as the projecting end of a wire that might be connected to the high voltage terminal opposite to the grounded terminal. Another less understood factor is that related to subtle biological influences, which might be associated with extremely low frequency electromagnetic fields of the type that can be generated by ac wiring and appliances and certain RF oscillators. While some studies have not demonstrated the existence of these interactions of electric and magnetic fields with living tissues, other studies, in vitro and in vivo, contradict these findings, showing real effects at certain ELF frequencies in conjunction with the local geomagnetic field. As proposed by Robert Becker, negative biological responses to magnetic field intensities as low as .3 mG must be considered a distinct possibility. On the other hand, over the last few decades, a new area of research has emerged that is looking into the possibility of therapeutic techniques based upon the existence of these subtle influences. Energy Medicine is founded upon a theory that proposes living organisms have the capability of utilizing the energy as well as the information that can be carried in complex waves of electromagnetic energy. Researchers such as Nikola Tesla, Georges Lakhovsky, Royal Raymond Rife, Antoine Priore and Gaston Naessens have made statements in this regard. The bottom line on all of this is that if you decide to reproduce the lamp driver circuit, it should be mounted inside of a metal enclosure, preferably grounded such as a fluorescent lamp channel fixture. The shielding provided by the sheet metal will help to reduce the level of stray fields. Regarding both the lamp driver and the Tesla oscillator configurations, the following material is provided for informational purposes only. The author disclaims liability for the use of devices constructed with the assistance the following material. . . . This booklet shows how a low power oscillator can be constructed that will power a fluorescent tube up to 40 watts in size or provide high frequency alternating current over a wide range of voltages up to perhaps 2 kv or higher, from a 9 - 24 volt source. The circuit is a BLOCKING OSCILLATOR that uses a single TIP 31 NPN power transistor and a few resistors and capacitors. These parts are mounted on an etched printed circuit board and connected to a suitable hand made transformer. 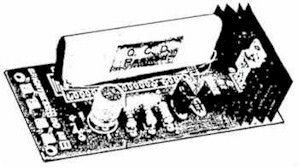 The transformer is either mounted on the PC board, along with the other components, or off of the board as is the case with the Tesla oscillator configuration. Early references to the blocking oscillator can be found in old US Army technical manuals where it is described as being used for pulse generation in primitive WWII RADAR sets. Mention is also made of the blocking oscillator's use in oscilloscopes for sweep voltage generation. A shortcoming of this type of circuit, apparently common to both tube type and solid state circuits, is its frequency instability, however this presents no significant problem in these particular applications. The circuit design was found while looking for durable a fluorescent light fixture for use in connection with a 12 volt dc power system. A period of experimentation with a number of "J. C. Whitney Type" fixtures came to a close with the location of Chinese made inverter ballast kit (See Figures 1 & 2). Upon deciding to clone the circuit, the first step was to locate a suitable NPN power transistor. Next, one of the original ballast coils that had failed in operation was disassembled and the three wires used in its construction were measured for length. Armed with this information it became possible to recreate the entire inverter/ballast circuit. Further experiments combined with a little common sense led to additional modifications and resulted in the present configuration. Figure 1. The Battery Fluorescent Light Kit assembled.